Wow, was not enough to describe the latest guided tour of the Civil Air Patrol’s 391st Composite Squadron. Love Field hangers, arranged by SM Juan Garcia, who is employed by Associated Air and conducted by Executive Vice President of Sales Patricio Altuna and George Florio. Associated Air Center specializes in producing the highest quality of interior design for large aircraft such as the Boeing 737, 757, 767 and 747.
to the customers exact taste and wants. A significant level of effort is put forth to capture every detail of the clients’ needs and desires based on criteria such as previously owned aircraft or status in the world community. The more the company knows about a client, the greater likelihood of achieving complete client satisfaction. The company then produces a detailed plan of construction that can be anywhere from 60 to 300 pages, before any fabrication work begins. After construction is complete aircraft certification is subject to the aircraft’s country of origin. As a part of the planning process, Associated makes note of which country’s aviation authority rules will need to be accommodated. You’ve heard, I am sure, of the urban myth of the aircraft owner who demanded that his bed be horizontal at all times during flight. Associated Air showed us the bed under construction. The bed could be automatically adjusted to accommodate that request to a maximum of 5 degrees “up angle” of attack. Associated Air not only does interior furnishing but can offer a client such services as aircraft inspection, maintenance and equipment upgrades. One example is modifications for additional fuel capacity. Since these aircraft will be carrying fewer passengers the luggage compartments can be modified to carry extra fuel. These extra fuel tanks can improve the aircraft’s available flight duration from 6 to 7 hours to as much as 12-14 hours. The key to success for every project is elegance and quality at any cost. 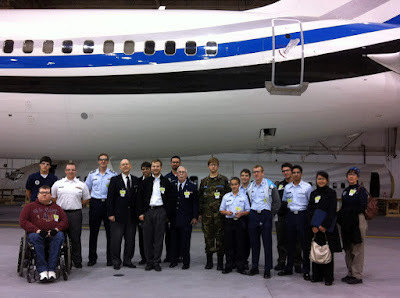 Having exposed the cadets to another career option within the world of aviation and experienced the results of Associated Air Center’s professional craftsmen, the tour concluded under the wing of the Dallas Mavericks new Boeing 757.